Caught this little nugget while checking out one of my favorite Philly sports sites today, Crossing Broad. 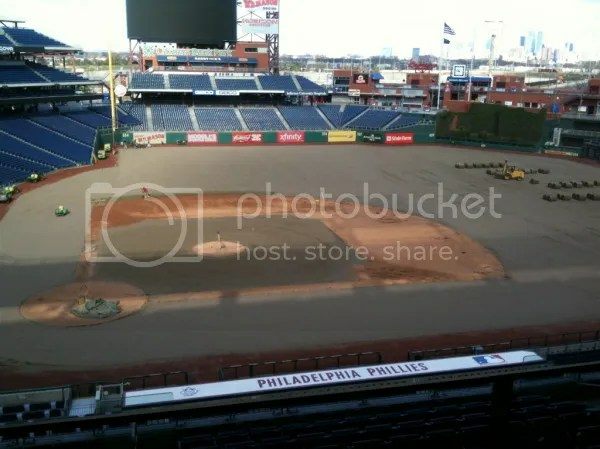 Apparently, the Winter Classic did such a number on the Citizen’s Bank Park field, they are pulling it all up and starting over. Checking out some sod-related websites, sod generally comes in slabs which are 2 feet wide by 5 feet long. UPDATE: I received a reply e-mail today from Mike Boekholder, the Phillies’ Head Groundskeeper, about the grass at the Ballpark: “We have about 101,000 square feet of grass on the field here at CPB. The rolls vary in length, but are cut 42″ wide. Typically, a roll is about 80′ long.” Thanks for the info, Mike!